The best iMag in cyberspace! 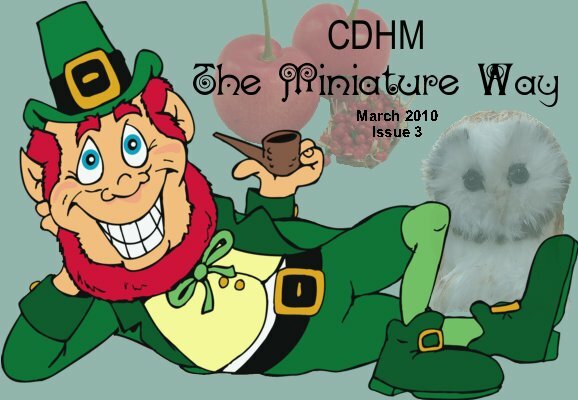 Check out CDHM's The Miniature Way...you won't be disappointed, I seriously think it's the best miniature iMag around at the minute...& IF you aren't a member yet...do it..join up...it's the easiest to navigate most friendly group I've come across. Always helpful, never critical & so, so supportive! Thank you to Jody at http://peachblossomhill.blogspot.com for this award! Here we go with the rules for this one! This one takes even more thought than the other awards...not only do I have to try & think of 7 blogs to pass it on to, but name 7 things about me that nobody knows...oh dear! 1) I smoke like a chimney & keep saying I'm going to give up..I even got an electronic ciggie to try & now I use both that & real ciggies! 2) I am incapable of saying "no" to people & always end up doing things that I'd really rather not as I can't use that word...I really must practise it! 3) I'm 57 but still think of myself as a twenty something...one of these days I'm going to have to stop wearing my jeans. 4) I have very eclectic tastes in music, sadly none of it classical or opera. The Doors, Cream, Led Zepellin, Moody Blues, Frank Zappa through to Fairport Convention, Joan Baez, Dylan, Matthew's Southern Comfort. 5) I'm still a hippy at heart...those were great times! 6) I prefer dogs to humans..they are far more reliable & loving. 7) I love my own company! There's nothing better than being in my workshop with my music playing & some clay in my hands! There you go....I'm not a very exciting person! Now then...who can I pass this on to who hasn't already been given it? If you've already received it, I'm sorry! Is anybody else having trouble with blogger changing the text at will? As far as I can see there are several different fonts in here! Now to leave a note on these blogs...assuming I can remember who I sent it to! 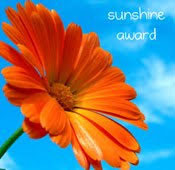 Thank you too to Ana at http://tinydelights.blogspot.com for another sunshine award! Take a look at her lovely foods. I'm not going to pass this one on as I think just about everyone has had it at least once!! What could be nicer (apart from a huge box of luxury handmade chocolates, of course! )than receiving a yummy chocolate egg, porcelain mug to fill with coffee to eat with your choccie egg & a lovely bunch of fresh daffodils! Can you tell that I'm wishing spring would hurry up & arrive! BTW...I rather think I've forgotten to resize the photos....again.....so when you click on them they'll probably be huge! Oh well!! 1) Display the image and publish the rules. 3) Pass the award to six blogs dream. 4) Send notice to the blogs listed. This is always the hard part! Here goes! 1)To Sumaiya for her wonderful blog! 2) To Kim who always makes the most wonderful cakes! 3) To Jeannette whose flowers & vignettes are simply fab! 4) To Marcella at Minicaretti whose pizzas are to die for! 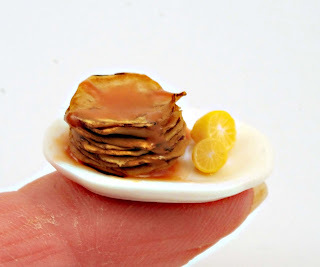 5) To Teresa who makes the most realistic miniature foods! 6) To Oiseau for her lovely foods! Now I just have to remember who I've sent the award too so that I can let them know!! Perhaps it's because my youngest daughter became engaged on Christmas day this year & the wedding is planned for August...not too much time to get organised, I think she thinks her mum is Supermum! !....but I seem to be enjoying myself in the mini sweatshop making wedding cakes of all descriptions! This one started life as a simple 2 tier & then decided to grow into a 4 tier cake with a separator between the 2 sets of tiers! Each pale purple tier is decorated with fondant moth orchids, although I've taken a little "artistic licence" here & made the middle sepals purple to match the cake & they should really be an orange/red! Then it decided to "sprout" silver fronds from the round top cake! For some bizarre reason when I tried to take pics of it the purple of the orchids darkened by several shades no matter what I did...oh well! I wonder how many miniature wedding cakes will appear from my workshop before the end of August! I just LOVE pancakes, however they come! Sweet or savoury, they have to be one of my favourite foods. If only I could get someone else to make them for me though I'd enjoy them so much more! It seems to take soooo long & I make such a mess when I'm making them that it would be great if, for once I could sit down to enjoy them without having had the trouble of making them! Making these miniature versions was nowhere near as messy as making the real thing, but I have to say that they took a whole lot longer...I could've made enough pancakes to feed an army in the time they took me! These are one of my weaknesses.....eaten with toffee sauce or simple golden syrup & lemon.....I'm making myself hungry! It's taken me many years to work out just how simple it is to make life easier when I fancy some pancakes but don't want to stand for ages over a hot cooker...spend the hours making way too many pancakes than we can eat in one meal & separating each with a sheet of greaseproof paper...freeze them!! Simple! Once I'd worked this out, I now have pancakes in the freezer for whenever the fancy takes me....until they run out of course & then I have to stand for ages re-making my stock! It has been so nice the last couple of days not to have to be thinking of making offerings for Valentines day & even though it's miserable, cold, dark & wet here...for the last 2 days it has hardly been light all day :-((, I've decided that Spring is on the way...it might be taking it's time, but it IS coming!! This little, miniature version of an Easter cake by the extremely talented & imaginative Real Size cake designer, Karen Goble, took me days to make, but I really, really enjoyed doing it...it was certainly a challenge! This little cake represents the renewal of Spring! An egg, Mallard families, butterflies & flowers all measuring 32mm at the base x 22mm to the top of the egg & is definitely OOAK as I don't think I'd have the patience (or the time!) to create it again! A change from romantic roses! I can quite honestly say that I have well & truly sickened myself of making red roses & valentine hearts...no more.....& we haven't even got to the 14th yet! As a little bit of light relief I decided I fancied putting together some little icing scenes &, do you know, for the 1st time in ages, I actually enjoyed doing them. It must have been because there wasn't a hint of a red rose or a heart anywhere to be seen! I enjoyed making this little board so much that I set to on another icing scene..this time chocolate cupcakes! Now I fancy making a real jam sandwich cake & having a big slice with a cup of tea!